Cinder House in St. Louis, MO., Chef Gerard Craft is serving Moqueca, an elevated take on the traditional South American seafood stew. Seafood stews have long had global appeal, and American chefs are drawing on traditions ranging from Latin America to France to the American West Coast for inspiration. When this wood-fire cooking concept opened two years ago, Corbet launched the menu with a bouillabaisse as a periodic daily special. Inspired by his grandmother and childhood summers spent in the south of France, the stew is made with mussels, clams, head-on shrimp, monkfish, scallops, octopus, baby carrots and pee-wee potatoes. It’s served with a side of rouille — the spicy, garlicky paste that traditionally accompanies bouillabaisse — and remains a Monday night special. Lulu Kitchen’s Executive Chef Philippe Corbet makes Bouillabaisse inspired by his grandmother and summers in the South of France. Corbet says the original version is only possible to get in the south of France or elsewhere on the Mediterranean coast, as making the classic broth requires Rascasse, a small scorpionfish found almost exclusively in the Mediterranean. Instead, he makes the dish using local seafood from Montauk. At Cinder House in St. Louis, chef Gerard Craft is serving an elevated take on Moqueca, a Brazilian seafood stew. Inspired by his childhood nanny, Dia, who he credits for igniting his love of food through her cooking, Craft’s version features snapper, head-on prawns, octopus and lobster all in a coconut milk broth with fingerling potato confit and seasonal vegetables. While stew is often a one-pot dish, Craft says his version of Moqueca involves a multi-layered lobster-based broth with the addition of wood-fired ingredients, such octopus and vegetables. 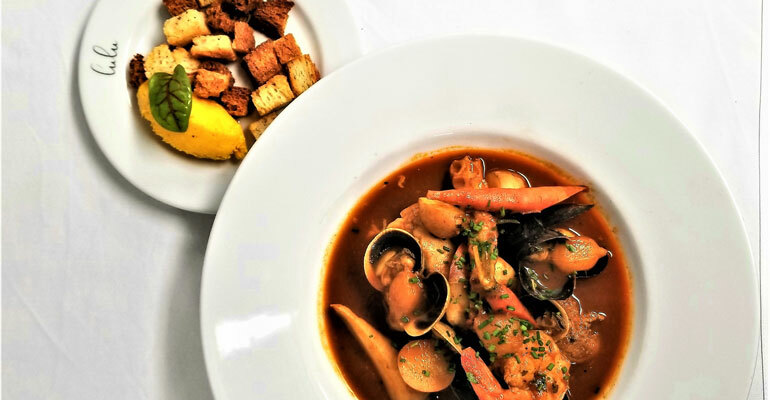 When executive chef William Muzio added what he describes as the “Ultimate Seafood Cioppino” to his menu at View, a waterfront restaurant in Oakdale, N.Y., it was because “other chefs were doing a Bouillabaisse and I wanted us to be different,” he said. While many make this fisherman’s stew with only clams, mussels and scallops, Muzio uses six different types of seafood: Maine lobster tail, jumbo shrimp, bay scallops, littleneck clams, PEI mussels, and a tomato-blue crab brodo. “We wanted to load it up with different types of seafood and give the customers something to remember,” he said. At King Tide Fish and Shell in Portland, Ore., chef Lauro Romero recently added a lobster bisque for dinner and a Cioppino for lunch. The bisque starts with a scratch-made stock made with lobster meat and shells, fennel, onion, garlic, tomato and fines herbes — parsley, tarragon, chives and chervil — along with white wine, brandy, cayenne pepper and cream. It’s served with a Parmesan-bone marrow crisp that is topped with bone marrow and lobster meat dressed in lemon and olive oil. For the Cioppino, Romero stays close to the San Francisco classic, serving up shrimp, crab, clams and mussels in a fennel-tomato sauce with crispy garlic bread. 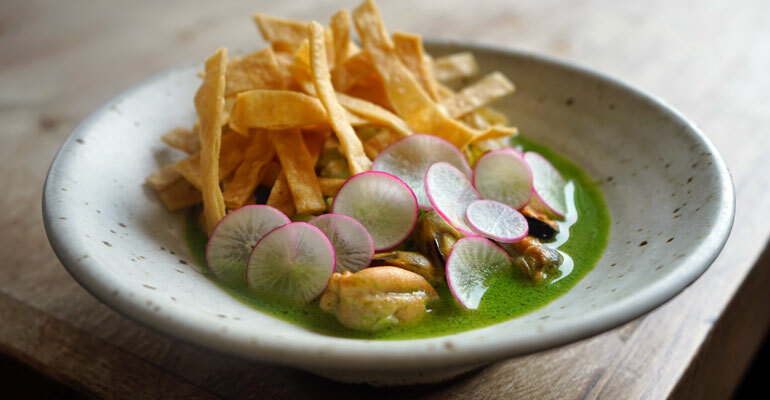 Pozole Verde, a hominy-based Mexican Stew, at Rustic Canyon in Santa Monica, Calif.
At Rustic Canyon in Santa Monica, Calif., chef and partner Jeremy Fox’s spicy Pozole Verde started out as an idea on a sample menu back in 2013, but now it’s a staple. Fox’s take on the traditional hominy-based Mexican stew replaces the traditional pork with mussels. It gets extra zest with lime and radish and is topped with house-made tortilla strips.